Celestina Warbeck and the banshees. The action takes place on a stage in the back section of Carkitt Market, where two shows are featured. The first is an elaborately-detailed puppet production based off of the two most popular stories in The Tales of Beedle the Bard (“The Fountain of Fair Fortune” and “The Tale of the Three Brothers,” as seen in Harry Potter and the Deathly Hallows, Part 1); the second is a jazz-style live performance by Molly Weasley’s favorite performer: the Singing Sorceress, Celestina Warbeck and the Banshees. Much like Hogsmeade’s live offerings, show times aren’t published in Universal’s in-park guide map, but they may be listed on the electronic displays or available via Universal’s mobile app. Also, again like the Frog Choir and Triwizard Spirit Rally, Carkitt Market’s shows will alternate at the same large, fully detailed stage. How do they decide which puppet performance to do? Easy – a scroll, that gets magically ejected out of a cauldron, tells them live on stage. 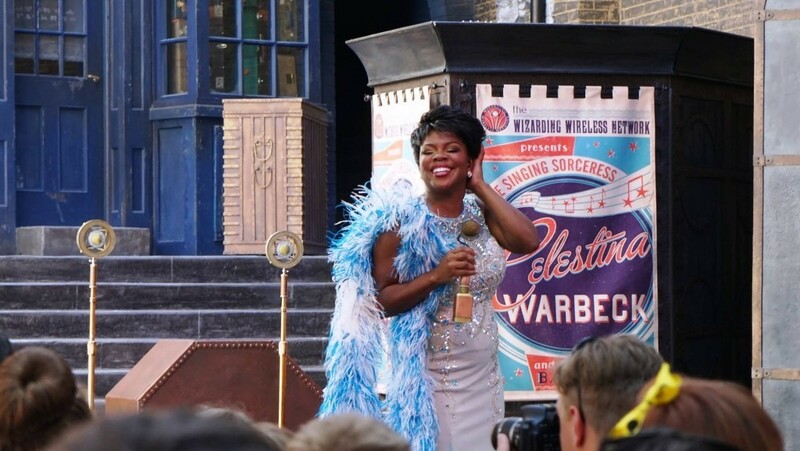 When asked who would most resemble Celestina Warbeck in our world, J.K. Rowling answered Shirley Bassey. This was used for the foundation of writing the songs found in the show. What an fantastic performance this was!!! The tales of beedle the bard and celestina warbeck was stunning!! Excellent performance! The first show we saw was Celestina Warbeck. We were sitting on the steps below the stage taking a break (after I just got picked in Olivander's I might add ;), when they came and asked us to move aside for the show. They also asked my husband if he would be the male volunteer and told him where to stand. He agreed and we stood over to watch the show. The actress playing Celestina in this version was fantastic. Very lively and extremely pretty! The whole show was fun to watch, and the part where my husband was dragged up on stage was particularly funny (or at least I thought so). The Tales of the Beedle and the Bard was also amazing. I wasn't sure what to expect with cheesy humor at first, but when it turned into the tale of the Deathly Hallows I was really impressed. The puppets were SO cool (yeah, I typed that statement as a grown woman). If you hear either of these shows starting up while spending time in Diagon Alley I highly suggest taking the 10 or so minutes to watch them. Both of these shows are well worth pausing to enjoy as you gulp down a Fishy Green Ale or Butterbeer. Both Celestina actresses are really great singers, I hope they stick around. The puppets in the Beedle the Bard show are amazingly cool, the show looks picture perfect to it's portrayal in the Harry Potter films and true fans will squee with delight. Universal hit it dead on with these quick shows, they add so much to Diagon Alley. I'm only reviewing the Celestina Warbeck show as I never managed to catch the Tales show. I saw Celestina twice. The first time I only caught the end of her last song, and the second time, I caught the whole show. I really liked it. Both the actresses who play Celestina (yes, there are at least two) are phenomenal singers, and the songs have a very catch jazz style about them. They even bring "Cauldron Full of Hot, Strong Love" to life which turns out to be a good song despite the cheesy title. If you get a chance to see the show, definitely do so. One of the better shows at US. Celestina is a great singer. I was not able to see Tales of Beetle the Bard due to rain. While Carkitt Market is covered (somewhat) the performance space is not and they don't perform when it is raining.